The lion is all breast organ. To have a look at threefoldness of mammals, we will compare three well known animals out of three specialized groups. For the rodents the mouse is taken, for the carnivores the lion and for the ungulates the cow. While walking in the woods we suddenly hear rustling among the leaves, which stops just as suddenly. We see nothing. We go into a barn or up to a cluttered attic and hear some scuffling, some small animal darting away, and again we see nothing. But if we wait quietly, sometimes we may see a mouse wandering around, eating a seed or a berry. With these remarks, mice are already somewhat characterized. We hear the sound of a small being that darts away, but we seldom see it. However, we find traces: food, droppings, the smell of urine. Mice are skittish animals that immediately dodge away to a safe hiding place when they are disturbed; usually to a spot underneath something, to a hole in the ground or under the floor. When we want to observe the behaviour of a mouse, we have to resort to a mouse in a cage. Then we see an active animal that does something different all the time. Mice are constantly busy, touching and sniffing at anything and everything. Toys like treadmills or roundabouts are used for a short time; then on they go to something else. They eat several times a day, characteristically using their front legs to hold food. Sometimes they take food away to eat it elsewhere. If we make a sudden movement, the animal reacts jumpily. When the animal sleeps in its hole, it is invisible. Mice sleep often, for short periods of time. In summary, mice are nervous, sensitive and easily disturbed animals. Sudden happenings in the environment may lead to acute, often frightened reactions. Mice notice much and are open to the world outside with their senses. The lion is called the king of animals. By loud roaring, which one can hear 16 km further away, the lion claims its territory. 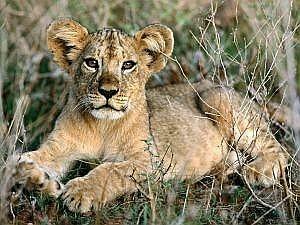 Lions live in troops - the so called pride - of one or two males, some females and some cubs and younger animals. They lie around, enjoying the sun or the shade of a tree, relaxing and sleeping, their heads and bodies lazily against each other. They rub their heads against each other and touch each other 'lovingly'. They may spend their time In this way for as long as 20 hours a day. Then they are completely relaxed. Cubs play with each other, it's a peaceful scene. Suddenly, some females detect a herd of prey animals. The hunt starts. 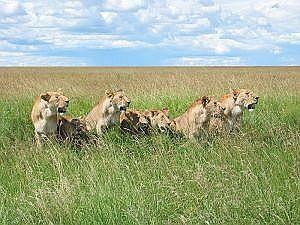 Lions can chase a group of animals (zebra, wildebeest or other ungulates) for more than an hour in harmonious collaboration. They stalk until they see the opportunity to isolate one animal from the herd. If this isolation-tactic is succesfull, some animals hide in the vegetation to deploy a final attack by surprise. From up to 30 meters lions pounce on their prey from behind or from the side. With their canines they bite through the windpipe or spinal cord and carotid arteries. Once the prey is dead, the males come closer and start eating first. Large chunks of meat are quickly devoured. The females have to wait until the males have finished, they are growlingly chased away if they come too close too early. After the females have finished, it's the cubs' turn. During the meal, there is a lot of mutual aggression. After dinner, all the animals go to a pool to drink a large amount of water and then they lay down and peace reigns again. 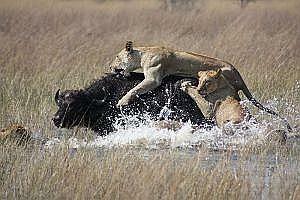 In the pride there is little mutual fighting. Between the males and females there is no hierarchy. Only when young males, who live in separate groups of nomads for years, want to take over leadership in the pride, they start fighting. The young males will try to violently expel the dominant male(s). When they have driven away the old male(s), they must submit to the females. That is done with aggression, too. Then they kill all the young animals and mate with the females. Only then they really are the leader. We see an alternation of quietly lying about and active hunting and of peaceful coexistence and aggression. Peace in the daily routine, aggression in the fighting. Compared with the other two animals, there is not much activity in this herd animal. There is not much interaction, except for the constant small skirmishes and threats to determine and confirm the hierarchy in the herd. Cows spend about one hour a day on social behaviour. They lick each other's skin for example. To confirm the hierarchy the animals threaten each other; low-ranking animals give way to animals that are higher in rank. Cattle are quiet, reserved animals that spend much time feeding and digesting food. The mouse strongly focuses on the external world: the lightest disturbance is detected and produces a strong reaction, which is often flight. Mice hide underground in a hole where they sleep, too. They live with their senses entirely in the outside world and they can back out of this only by going underground. The lion lives in the alternation of rest and hunting, of peace and aggression. There is alternation of tension and relaxation in the pursuit and attack: the tense relaxation in the ambush and the vigorous contraction of muscles in the final attack. In summary, a constant game of falling off - and coming back into balance (Steiner, in GA 230). With the cow the senses are more internally focused. This animal is engaged in eating, ruminating and digesting food for a large part of the day. Observing - and responding to the surroundings (the salivary glands in the head are larger than the brains) - and feeling (cattle have little facial expression) are much less developed. 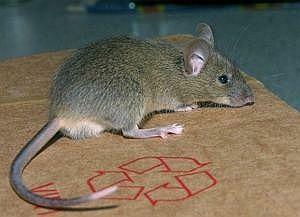 Mice are small animals with a long tail. The house mouse is 20 to 50 grams and its body without tail is 7 - 10 cm long, the tail adds another 7 cm. If you look at the the body without the tail, the head seems to turn into the body as if there is no neck, the legs are for a great part integrated in the body. The body is close to the ground and in rest the belly touches to the ground. The back is round, the backbone is rather round, too, and the posterior part of the body is higher than the head. The emphasis of the body mass is posterior rather than anterior. 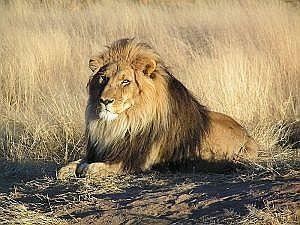 Lions have a medium sized, 120 - 200 kg heavy, flexible, mobile body with a long tail. They move with agility and can make their normally straight back round. The posture of the head, on a clear and strong neck, is higher than the backline. Lions have considerable facial powers of expression. The forehand of the male is heavier built than the rump, partly due to the mane. In lionesses this is much less the case. The tail is rather long. The body does not touch the ground. Cows are quite large. They are up to 1.80 m high and have a massive body of 650 kg. They are high on their legs, the trunk is far from the ground. The torso dominates. The head is connected to the torso by a somewhat slender neck, and is almost on the same level as the backline. On the forehead there are two curved horns. The top of the shoulders makes the bull heavier on the anterior side. 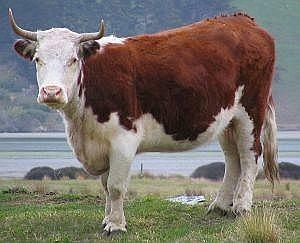 The cow is more balanced due to her udder and the lack of the high shoulders that characterize the bull. The emphasis of the body mass is anterior, rather than posterior. The fur of mice is brown-grey on the upper parts and grey-white on the lower side. 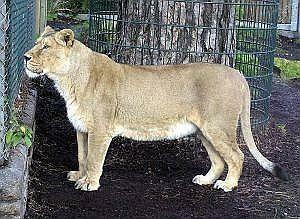 Lions are light brown, the underparts are somewhat lighter coloured. Males have a dark brown mane. On the tail end is a black tassel. The cubs are light brown spotted, on the lower side and the legs the spots stay visible for a long time. Cows are originally red brown (the cows) and dark brown to black (the bulls) coloured animals with a lighter eelstripe on the back down the spine. Around the mouth is a light ring. Common breeds are black and white or brown and white spotted, others are uniformly coloured, from white till black. The big eyes of the mice are prominent. They have big ears and long whiskers near their mouths. These whiskers notice the lightest trembling in the air. On the legs and the body are many tactile corpuscles, the tail is sensitive, too. 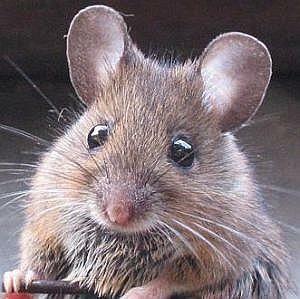 Despite their big eyes, mice do not see very well, orientation is mostly done by smell. 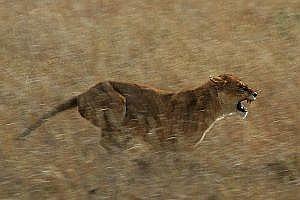 Lions can see well, especially moving objects, they even see well in the dark. Hearing is good and their smell is excellent. Cows can see well. Even at great distances they can recognize objects or men. They can see colours. Hearing, smell and tast are good, too. The heartbeat and breathing of the mouse are fast: breathing is 160 times a minute and the heartbeat is 450 times a minute. Lions have a relatively big heart and big lungs. In relation to its body weight the heart of a lion is 3 times as heavy as the heart of the horse or the cow. The hind legs of the mouse are better developed than the front legs. Mice sometimes stand on their hind legs and use their front legs to hold food. They walk on the anterior part of their feet. The legs of the lion are of medium length. Lions go on the cussions of their toes (digitigrade). The limbs are agile. They go about with a lithe, springy, smooth pace. There is much muscle mass around the skeleton. 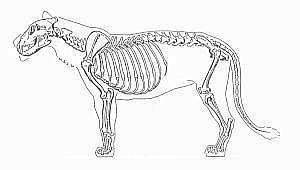 The skeleton of a lion is only 13% of body mass (a horse: 20%). The legs of a cow are long; especially the outer parts of the legs, and the toes are extra long. 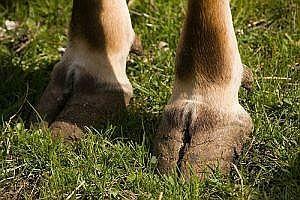 Cows go on the nails of two toes, called hooves. What we see and call the legs are the lower legs and the toes, the upper legs are internal. Cows walk somewhat stiffly, running looks laborious. In de case of mice 10-12 naked, blind pubs are born after a gestation period of 3 weeks. The pubs are born in a hole underground. After 20 days the pubs are already independent. There are several litters a year. The lioness searches a suitable place away from the pride to give birth to the litter. This spot must provide protection from moisture, sunlight and drafts and is called a den. After a gestation period of 110 days, 2 to 4 spotted and blind cubs are born. The eyes open after 1 week. When the cubs are able to walk, families can be formed of several females with their litters. After about 8 weeks the lioness and cubs go back to the pride. Cows give birth to only one calf after a gestation period of nine months. The calf is able to stand up and walk directly after birth. In the wild a nest is made at a remote location where the calf stays for a few days. Several times a day the cow goes over to suckle the calf. Mice eat seeds and nuts: high-quality vegetable food with a high percentage starch or fat. Food is sometimes taken to eat elsewhere. Mice also stock up food supplies. 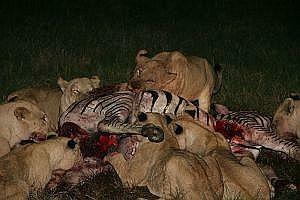 Lions eat up to 30 kg meat a time, mostly of big prey animals, sometimes of smaller ungulates. They can eat carrion. Cows eat grass and herbs. They wrap their tongue around small clumps of grass and pull it loose. That is why they only eat longer grass, they cannot bite short grass (horses can). Grass is low-quality, hard to digest, energy-low food. Cows eat approx. 50 kg of fresh material a day and they drink up to 100 liters. 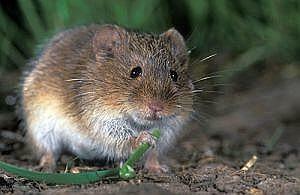 The mouse has a relatively big stomach and a short digestive tract of 8 times its body length. The blind gut is large. The salivary glands are relatively large, because of the dry food. Mice produce dry pallets that are hardly useful as manure. Lions have an even shorter digestive tract of only 7 meters or 4 times their body length. The digestion of meat is easy, but needs a powerful digestion of strong stomach juices. The digestion is quick. Their faeces is smelly and not useful as manure. The food of the cow is hard to digest. First the grass goes to the rumen, where it is digested for some hours by micro-organisms. Then it is burped up to be ruminated, and then it goes to the rumen again. Only when the food is sufficiently broken down, it goes on to the reticulum. The digestive tract is 50 - 60 meters long, that is 25 times the cow's body length. The cow has four stomachs: the rumen, the reticulum, the omasum and the abomasum. The abomasum corresponds to our stomach, the other three are excrescences of the oesophagus. The manure is somewhat moist and very fertile. The teeth of a mouse are dominated by four long, chisel-like incisors. By nibbling these incisors wear off; they keep growing all the time, however. There are no canines, the molars are big and have transverse ridges. The direction of chewing is front - back. In the teeth of the lion long sharp canines dominate, with which they tear off the meat of the prey. 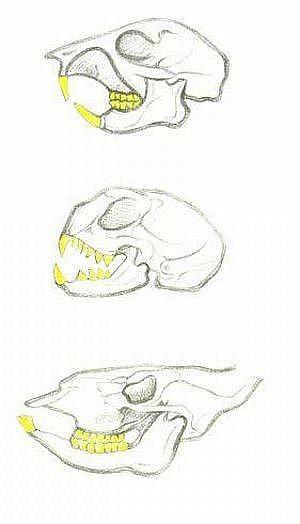 The incisors are small and the carnassials are sharply pointed and look somewhat like canines. The direction of biting and chewing is up and down, perpendicular to each other. In the teeth of the cow big molars dominate, in which the creases are lengthwise. There are no canines and incisors in the upper jaw. The direction of chewing is sidewards. Mice have large senses and relatively big brains. They are active all the time and constanly go from one activity to another. Everyting is done for a short time, they even sleep for short periods of time, several times a day. Heart and lungs beat fast. If we hold a mouse in our hands, we notice it trembling, being nervous. Mice live from their nerves. The nerve-sense system forms, as it were, the entire body. The blind gut is important for the digestion of food. In the teeth the incisors dominate. 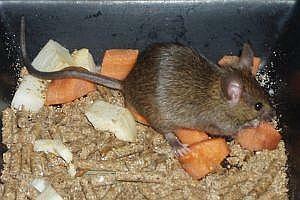 Mice store up food supplies in deposits, they do not store fat deposits in their bodies. Lions have relatively big lungs and a well-developed heart. They often have playful and loving relations amongst each other and are agressive at other times. 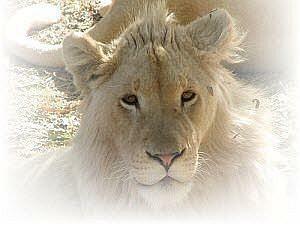 The expression in the middle part of the face plays an important role in the social life of the pride. The lion is an animal that lives out of its feelings. In the teeth the canines dominate. Food is quickly digested and does not put a strain on the body (in contrast with the cow, where the hard-digestible grass is ruminated). Observing does not strain the body, either (in contrast with the mouse, that reacts to every sensory stimulus). With cows the blood circulation gets heavy, with mice breathing gets nervous (as with birds, see: Steiner, GA 230). In the lion there is balance between blood circulation and breathing. Breathing-frequency and rhythm of the heartbeat are balanced, in harmony. The cow has a long digestive tract and is occupied with the digestion of food full-time. The metabolism is found in the entire body: it ruminates (in its mouth) and the rumen and other extra stomachs are formed from the oesophagus. Digestion is in the front part of the cow's body, compared to the mouse (in the posterior part of the body, the blind gut), and the lion (in the middle, in the stomach). In the teeth the molars dominate. Cattle eat a lot of low quality food, with which they build a large body. The cow connects intensively with the earthly materials. To change cellulose into milk and meat the metabolism needs a lot of strength, power and energy. There is much perseverance and a strong will in their digestion. The legs are long and specialized, by reduction of the number of toes. The skeleton is heavy. Man has a different relation with animals of these three groups. Dog and cat are pet animals, animals that come into the house and are being loved. Cow, horse, goat and pig are kept as livestock, they come into the stable and are useful animals. Mice and rats are kept as pets, too, but in a cage. But they also come into the houses unwanted and eat of people's food. They are mainly pest animals. 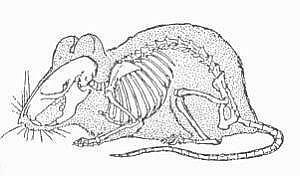 The mouse lives in its surroundings, has sense organs over its entire body, observes much, reacts strongly to what it experiences, can hardly cut itself off from these experiences. The accent is on the nerve-sense system. We can call it a nerve-sense animal or a thinking animal. The lion lives in the alternation of peace and aggression. This animal lives out of its rhythmical organs. Rhythm is seen in the spots on the fur of the cubs, too. The heart-lung system is well developed. It can be characterized as a heart-lung animal or a feeling animal. 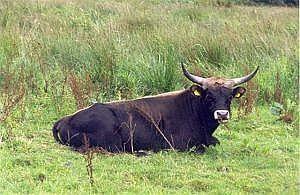 The cow lives in its powerful digestion and the building and maintenance of a large body. Its limbs are specialized. The metabolism-limb system is well developed and the cow can be called a metabolism-limbs animal or a willing animal. The nerve-sense animal is the smallest of the three. Activity of the nerves and an orientation on the surroundings cost a lot of energy. The high quality food is converted into activity. The metabolism-limbs animal is the biggest. The low quality food is made into a large body. This animal is dreamy and not very awake and it is centered on its metabolism. Food is converted into a massive body. The heart-lung animal takes up a position between these two. A polarity exists between the centre of activities and the mass centre of the body. In the mouse the accent is on the nerve-sense system, which has its centre in the head. The mass centre is on the other side of the body, on the posterior part where it is build higher and in the long tail. 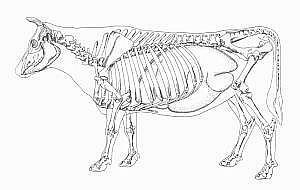 In the cow and more so in the bull the body is heavier on the anterior side; whereas the metabolic-limbs system has its centre in the rear end. The lion is inbetween. The body is balanced, neither front nor rear side are bigger.